Without any attempt on my side we enjoyed a Syrah weekend, along with a unique Cabernet Sauvignon from Herzog. This past weekend we were invited to the home of some very good friends of ours, ER and HK, ER of the baking culinary fame! Well this meal was culinary all the way, roast beef, perfectly cooked chicken and great side dishes to boot! OH! I cannot forget that split pea soup, which was quite lovely as well. We brought two Syrah like wines and another guest brought a Syrah wine, while yet another guest brought the new and limited 2007 Herzog Napa Cab 7. Sorry, I have no pictures, though most of the wines are well-known wines, other than the special Herzog Cabernet. 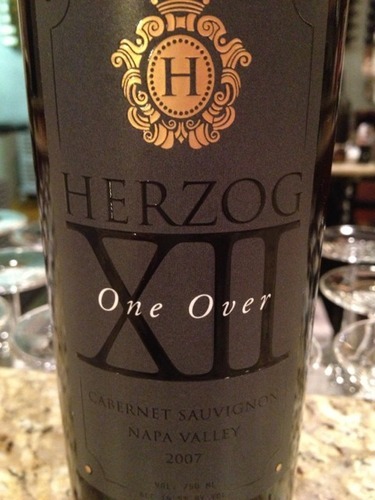 The wine is called: 2007 Herzog One Over XII Napa Valley Cabernet Sauvignon, and Vivino has an image of it, which is displayed to the left. The wine has a great story, a bunch of barrels from the 2007 Herzog Napa Cab, which we tasted, was left in a barrel for 55 or so months. So, one would think it would be an oak bomb, but it is not overpowering, though friends of mine disagree. The thing that is really lovely about the wine is its caressing and insane tannins and the mineral that jumps up and slaps you across the face! Like I say in the notes – this wine is polarizing and to me that is what good wine is all about! This bottle is limited and available only at the Herzog Winery’s wine bar. The nose explodes with awesome blueberry, plum, currant, cherry, with loads of dirt and licorice. The mouth on this medium plus bodied wine is nice and spicy with good concentration of date, sweet blue and red fruit, nice candied raspberry, sweet cedar, with good integrated tannin, and good extraction. The finish is long and spicy with garrigue, bramble, fig, date, chocolate, light leather, and animal notes. This is a wine that is a hair under the QPR line, though if pressed it could well join the ranks. A great Israeli “supermarket” option for sure. What can I say all things SMV captivate me, the sweet blue and black notes are a siren that I am lost to ignore, and the control and finesse used throughout, shows Dalton as the winery I have always felt it is – top notch and professional. The wine is a blend of SMV, 82% Shiraz, 12% Mourvedre, and 6% Viognier. While, the wine does not start with that evocative and perfumed nose of peach and apricot that comes from the viognier, there is a perfume of floral notes that scream through the thick layers of ripe blueberry, blackberry, black plum, and of course root beer (AKA ginger on steroids), along with sweetened anise, graphite, mineral, dirt, and quite literally sweet and ripe raspberry jam. As always Dalton knows how to push the envelope but keep the wine from going over the cliff of sweetness, with a controlled sweet nose. The mouth is medium to full in body, more to the side of medium, and one that is in no way shy, with a concentrated attack of black and blue fruits that hit you in waves with good acid balance, filled with boysenberry, plum, and currant presented in a mound of sweet cedar, along with searing mouth coating tannin. The finish is long and spicy with crazy tart and ripe fruit, lingering long with sweet tobacco, espresso coffee, bakers chocolate, and many lovely spices, cinnamon, sage, cloves, leather, along with heaps of black pepper, and black and blue fruit covered with sweet vanilla. This is a great Israeli and US QPR wine. This is the same wine that I loved some years back when I enjoyed it in a sukkah with my friends here in California, but that bottle only sat in oak for 23 months. This bottle has MANY of the same characteristics of that lovely wine, but it also has more oak impact than the normal bottling did. The reason for that was that this bottling sat in oak for 50+ months! This is a very limited release with only 12 barrels and as such will only be limited to the tasting room. The nose on this dark purple colored wine starts off with lovely graphite, along with hints of dill (classic oak characteristics), sweet oregano, blackberry, sweet butterscotch, toast, and coffee. The mouth on this medium plus bodied wine is filled with black ripe fruit, fruit that is controlled and sweet, along with more sweet herb and oregano again, and layers of fruit, chocolate, and sweet tannins that interplay and caress your mouth through the long finish. The finish is long with more sweet herb, mounds of mineral, graphite, charcoal, mint, and sweet cedar. This is a wine that shows great power yet also nice finesse. In the end this is a wine that will be highly polarizing. Some will find the insane oak impact unacceptable and others will love it, but if you can, attempt to enjoy this with an open mind and hopefully you will see the lovely oak characteristics that are not overpowering as much as they are complimentary! This is a nice wine that originally I did not like as it had a short finish, when I tasted it in Israel. However, the wine we tasted this past weekend, was not short in any way – but it was also more sweet than in Israel. Either way, this is one of the first Yarden Syrah that is showing true blue and black fruit, along with good earth and tobacco all around the edges. The mouth on this medium plus bodied wine is layered with good ripe blackberry, blueberry, cassis, and black plum all coming together with sweet fruit, mouth coating tannin, and sweet cedar. The finish is long with nice tobacco, chocolate and spice, that hints at roasted animal and licorice. Posted on October 14, 2013, in Israel, Israeli Wine, Kosher Red Wine, Kosher Wine, Wine and tagged Adama, Alma, Cabernet Sauvignon, Dalton Winery, Herzog Cellars Winery, Napa Valley, One Over XII, Shiraz, Syrah, Syrah - Mourvedre, Tabor Winery, Yarden Winery. Bookmark the permalink. 1 Comment.